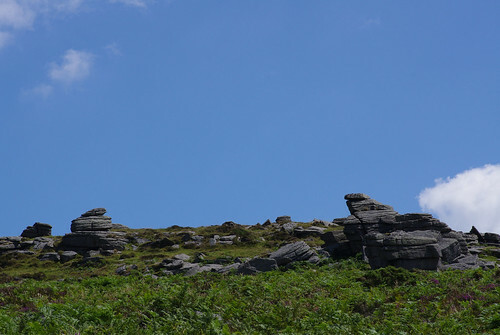 Aside from the big two tors, Hay and Hound, (where coachloads of tourists are off-loaded to stretch their legs and the more intrepid race to the top of the hill), there are literally hundreds on a smaller scale, dotted around Dartmoor; granite outcrops carved by wind , rain and ice. Apart from the weekend letterboxers, searching for pads and stamps in every niche and cranny, these tors are generally quiet places, frequented more by gatherings of ponies than people. I can't remember going up Yar Tor before (not that there was much of an "up" to it) but it was well worth an investigation, with splendid vistas to be enjoyed from every angle. One of the benefits of large parts of the moor having been designated Open Access Areas is being able to wander at will within the orange-borders on the map. Of course, this should be done responsibly, especially during the summer months, when there are ground-nesting birds. It is always advisable to walk where someone (or something) has gone before and there are usually a plethora of choices, where cattle, sheep or ponies have gone from place to place. On the open moor, without a signpost in sight, even a footpath can branch out in several different directions or can perversely peter away into nothing. In our weaving descent, we follow a path of sorts, going round the gorse and arms up through the tallest bracken, watching our feet with every step and proceeding with caution, taking the least boggy route down to the river. Then we crossed a clapper bridge, negotiated a set of stepping stones spanning the river and walked upstream. Bilberries grew on the ground and we tried a wild raspberry each and found them delicious. Further on, where the trees had been cleared, brambles thrived in the clearing but butterflies and damselflies were disappointingly few and far between. I was here three weeks ago and the place was teeming with them. We also found the path a strange place. Though it was clearly deserted in both directions, more than once we both heard the murmur of voices and looked around to make sure we were the only visitors. Perhaps the river was impersonating voices as it ran over the rocks. On the bank of pine needles there lay, incongruously, a towel and a scarf next to each other. They were there the last time I passed through. Might they still be there the next time, too? Our outward journey ended just beyond a stile, where bog ashpodels announced a change in terrain. We paused to watch the river where emperor dragonflies patrolled out of macro reach and small fish came to the surface, creating a bubble and splash. It was on the way back, that we inadvertently discovered the "find" of the day. As often happens, I walked straight past it, gazing intently at the river for some sign of calling, luring sirens. It worked its way up the grass stems, first giving us a tantalising glimpse to half-open wings and colourful markings, then treating us to its cuddly side profile. Sherry said it had an owl's face. The moth continued its ascent as we wondered aloud what it was (we are still wondering now!) before faintly fluttering away. Back at home, I gave myself a headache searching for an identical match online. 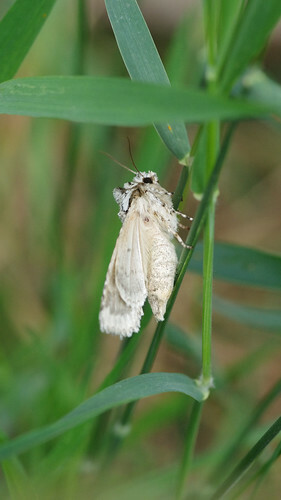 Conclusion: we need a dedicated moth guide. The other thing we desperately need is a decent tripod. Sherry struggled to get the backgrounds right to her flowers today (while the flowers were clear enough, the stems and leaves tended to come out looking grainy.) The overall effect was not as appealing as usual. Increased depth of field was sought, and when tried must have led to camera shake and blurry backgrounds. The obvious other solution would be to use the camera's flash but to both of us it seems wrong to photograph the magnificent creatures we come across and stun them blind in the process! If I was a creature in a secluded spot, I know I would not take kindly to being so rudely disturbed! 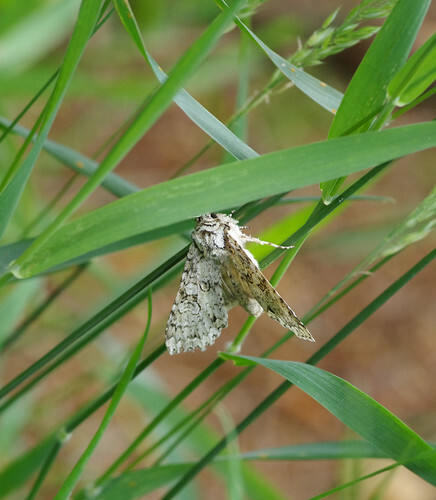 UPDATE - I'd like to thank Jacqui West and the team at Devon Biodiversity Records Centre for identifying the species of moth as Grey Arches (Polia nebulosa). As I suspected, the colour form of this species is extremely variable. According to Chris Manley's British Moths and Butterflies: A photographic guide, it is "variable from near-white to near-black."